Canada has more to offer than most people realize. From their beautiful mountains to their long coast lines, there’s plenty of culture, food, animals, and activities to experience between. 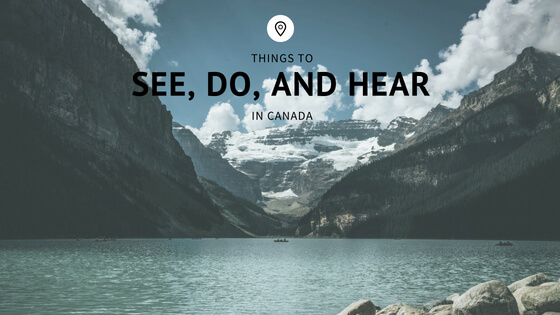 Here are just a small fraction of the things you can see, do, and hear in Canada. Located in the Canadian Rockies, roughly 75 miles (120 km) west of the city Calgary is the Banff National Park. The park is known for its beautiful sites over mountains and lakes. The brilliant terrain makes for great outdoor activities throughout the year such as skiing, hiking, boating, and mountain biking. The town was named in 1884 after its counterpart in Scotland. The ski slopes evolved in the early 1900’s thanks to the mountain guide experts from Austria and Switzerland. Today, it hosts a plethora of restaurants, bars, and shops. Vancouver is a large metropolitan city found on the west side of Canada. Here you can find some of the best culinary destinations the country has to offer. They have a large variety of Asian options and a wide array of fresh seafood caught in the Pacific Ocean. As of late, the city has seen a major influx of craft-beer breweries popping up. Along with their cuisine, Vancouver is also known for their artistic culture. Throughout the year, there are many festivals, open-house art gallaries,. theatrical events, and live music to experience. Known as one of the most multiculturally diverse cities in the world, Toronto is definitely a city you will want to visit on your trip to Canada. Over half of the residents living in Toronto where born outside of Canada and it’s estimated that over 140 languages are spoken here. It’s suggested to visit this vibrant city in the spring or fall time to get the best weather. Regardless, you’ll find happening clubs, bars, restaurants, and nightlife here all year round. Take a visit to the CN Tower, see the arts, walk through St Lawrence Market or see a Toronto Maple Leafs game. There’s plenty to do here but if you wish to venture out, the Canadian side of Niagara Falls is just a two hour drive away.